The idea of having a summer wedding is just lovely. The green grass, sunny skies, and breezy aesthetic are what make this peak wedding season. The reality of having a summer wedding can sometimes be…less than lovely. The mosquitoes, sweat stains, and the HEAT of summer are all inconvenient truths we tend to ignore. Despite the heat, we believe that summer weddings can be completely enjoyable and are totally worth it! You just need to be prepared so that you, your guests, and your flowers can take on any weather situation with ease! Here are 9 Tips to Help you Enjoy your Summer Heat Wave Wedding! Outdoor summer weddings mean that you and your guests will be spending hours outside in the sun. One way to help guests stay cool and prevent painful sunburns is to provide some protection. Simple white umbrellas and fans will do the trick, without ruining your photos! Save black tie for indoor, evening events. Daytime events, especially those outdoors, permit a more casual dress code while still honoring tradition. Excusing guests from the strict blazers, neckties, and long dresses in favor of button downs and sundresses will be most appreciated! This is especially important if you plan to have the ceremony AND reception outdoors. Having some extra ice buckets packed with cold bottles of water scattered around the space is a great solution for hot wedding days. If your event is a bit more formal, ask your wedding planner for a few extra drink stations or have waiters available for refills. Unless you plan to have a casual, sundress kind of wedding day (which we love), you’ve probably planned for a long gown and/or a full suit/tuxedo. While these might be okay for a while and will look great in photos, in the summer heat, they start to get quite uncomfortable. 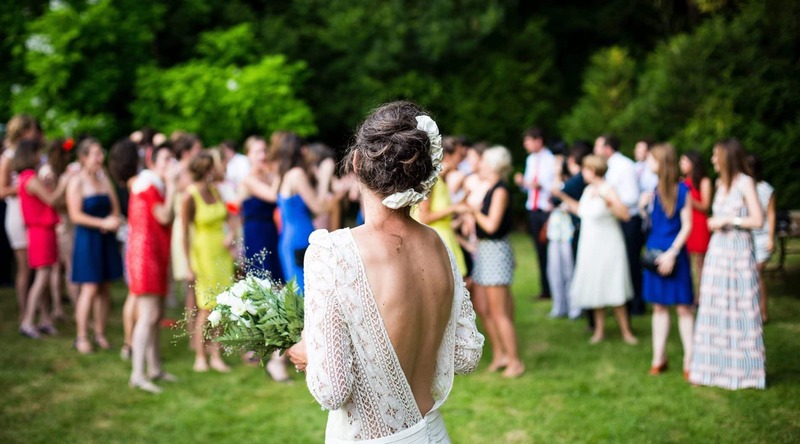 If your reception is going to take place outdoors, consider a costume change! The sun can be the enemy of photo taking. We just don’t look our best when we’re squinting, sweating, and very red in the face. In order to avoid this, ask your venue if there is a covered area with shade for photos. If you have the option, you may even want to consider doing some of your photos indoors. Heat will wither even the most beautiful flowers. If it is going to be especially hot and sunny, see if your florist will make two identical bouquets. This way, if one becomes a bit wilted or soggy in the heat, you will have a fresh one for photos. If you plan to have the ceremony outdoors on the hottest day of the year, we recommend that you keep it short. If you have additional ceremony pieces, like a song, a long reading, or a sand ceremony, consider doing this during the reception when everyone is out of the sun. We know that there are important elements you’ll want to include, but those meaningful moments have a place during toasts and first dances. Trust us, you’ll be thankful for brevity the day of the event. Nothing cools everyone down like a nice cold beverage. Whether you choose to serve cocktails, mocktails, or a refreshing pitcher of lemonade, make sure it’s nice and cold! In addition, consider serving a cold dessert option, like ice cream sundaes instead of traditional cake. If you find that the weather on your special day might be too hot, you may want to consider utilizing some indoor spaces. While you don’t have to take the whole event indoors, it can be nice to have a place inside to escape to when you need a bit of air conditioning. An indoor ceremony and cocktail hour can be paired nicely with an outdoor reception later in the day. Or a beautiful morning ceremony can be a lovely start to an indoor mid-day reception. Are you ready to plan your own outdoor summer wedding? Why not have it in our gardens? Check out our website for our wedding packages and photos! What are some tips and trick you have for surviving a summer heat wave wedding? This entry was posted in Tips, Weddings and tagged heat wave, summer, tips, wedding by joy. Bookmark the permalink.